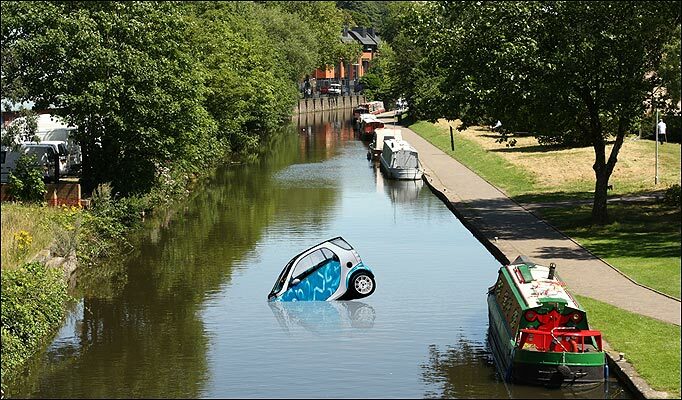 Bike-friendly Holland is having a hard time adjusting to the new government policy promoting electric/fuel efficient cars — dozens of Smart cars have been tossed into Amsterdam canals this year. An empty deal would be worse than no deal at all, said the White House before Mr Obama travelled to the Copenhagen summit. As the meeting ended, Barack Obama was calling the Copenhagen accord – the emptiest deal one could imagine, short of a fist fight – an “important breakthrough”. Mr Obama’s credibility at home and abroad is one casualty of this farcical outcome. The agreement cobbled together by the US, China, India, Brazil and South Africa is merely an expression of aims. It recognises the scientific case for keeping the rise in global temperatures to 2°C. It calls on developed countries to provide $100bn a year in support of poor nations’ efforts by 2020, but without saying who pays what to whom. It appears to commit none of the signatories to anything. Many developing countries were bitter about this result. Europe may wonder why it has been airbrushed out of the picture. The meeting as a whole could not bring itself to endorse this vacuous proclamation. It took note of it.